"Snapdragon Wear 2100, at a very basic level, is about building a very solid foundation – allowing our customers to build beautiful houses, based on that foundation." That's the vision of Pankaj Kedia, senior director and business lead of Qualcomm's Smart Wearables team. The chipset, the first fruit of the wearable-focused Snapdragon Wear platform, is set to dominate the smartwatch arena over the next few months. Kedia told us that as many as 25 projects are currently in development and the first "beautiful house" has just gone live over in Switzerland at Baselworld 2016. Nixon's The Mission is an Android Wear device, promising to be is the ultimate adventurers' smartwatch. According to Kedia, Snapdragon Wear "takes the best of Snapdragon, and the best of wearable unique features and creates a platform for the next-generation of products." That "best of Snapdragon" line is important because it's the first real admission that the chips found inside the first wave of smartwatches, in particular Android Wear smartwatches, were powered by a processor never designed with wearables in mind. Qualcomm claims to have shipped 65 wearable products, in 30 countries, in the last 18 months. The more high-profile of these, Android Wear smartwatches such as the Huawei Watch, the LG Watch Urbane and the new Moto 360, packed a Snapdragon 400 – a chipset designed primarily for smartphones. The Samsung Galaxy S3 Mini was running on the 400 way back in 2013 – so it's not exactly cutting edge. Many of the major criticisms of smartwatches – bulkiness, poor battery life and so on – are a direct result of the constraints of hemming a smartphone chipset inside a much smaller form factor. Snapdragon Wear addresses these issues. "Snapdragon 400 was the first chipset we used to win the hearts and minds of our customers," explained Kedia. "But as the business has grown over the last 18 months, we decided we needed to dial up our investment. We've spent the last few months and quarters building up our next generation platform that we are calling Snapdragon Wear. "We want to leverage our IP in the smartphone space while at the same time innovating in areas that are unique to wearable devices. It's all about the four vectors of wearable innovation – size, power, sensors and connectivity," he added. "We've reduced the size of the chipset by 30%. That means smaller footprint devices, so smaller diameters and thinner watches. The first generation of smartwatches was focused primarily at men but Wear 2100 enables a variety of form factors including female friendly watches. We've also reduced power consumption by 25%, which means a lot more battery life." 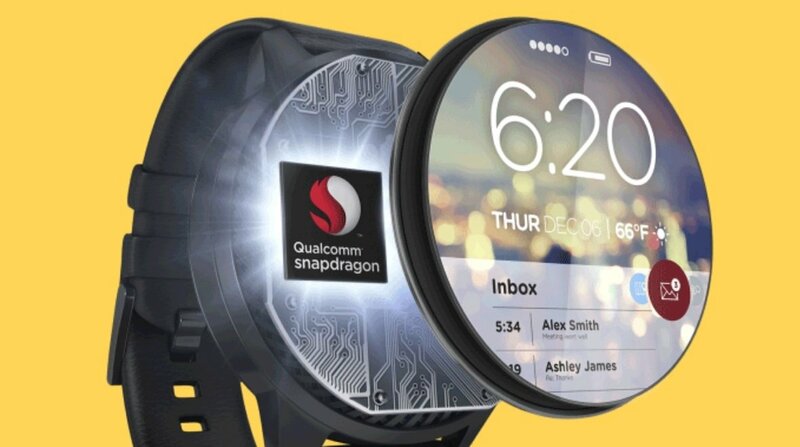 The Qualcomm director was also keen to stress that Snapdragon Wear's connectivity options mean a boost for the inevitable next step in smartwatch evolution – smartphone tether-free features. "LTE connectivity provides new use cases and provides the freedom and flexibility to leave your smartphone behind. It gives you another leg to stand on," he explained. "We are working with multiple customers on connected wearables. That's a key focus that our customers have, and we have, and you'll see a number of them introduced to the market over the coming year. It will have very tangible implications on the adoption of wearable devices." Getting technical for a moment and Snapdragon Wear 2100 is based on ARM Cortex-A7 architecture. Behind the scenes, the trails are already being blazed for the next-generation Snapdragon Wear chipsets. ARM's Cortex-A32, a 32-bit processor built on the ARMv8-A architecture, is 25% more efficient than the Cortex-A7. "By launching Cortex-A32 we're giving a road map to our partners to enable them to continue driving efficiency, while maintaining the performance," David Maidment, ARM's mobile segment marketing manager, told us. "It's a critical building block in driving the next-generation of untethered smart devices, whether that's a smartwatch or another form factor that wearables want to take." We asked Maidment if that meant the 2100 was dated before it's even arrived. But it's all part of the cycle. "ARM, as an intellectual property developer, is physically working on a two to five-year horizon, beyond where chip companies are working. "We're out there developing new generations of CPUs and GPUs in order to deliver to our semi-conductor partners, who will use those along with their own IPs. That's why you see a certain de-coupling from when ARM makes its announcements and when you see partner silicone boasting the technologies." Qualcomm's Pankaj Kedia explained how Snapdragon Wear 2100 could be used with other wearables, not just smartwatches, and, as he said himself: "Size matters – the smaller the better." And when it comes to miniaturized modules, nobody does it smaller than OriginGPS. The Israeli company recently revealed the Multi Micro Spider; a 5.6 mm x 5.6 mm module boasting the world's smallest footprint within a fully integrated multi-GNSS module. And while it doesn't boast the application accessibility or connectivity of a Snapdragon chipset – it could be just what sports focused smartwatches are crying out for. In fact, there's no technical or economical reason why top-end fitness trackers from the likes of Fitbit and Jawbone shouldn't be packing GPS connectivity. That's what Brandon Oakes, sales manager at OriginGPS, told us. "I spent six years working at Garmin as a design engineer so I understand that, on the low-end, adding a few dollars of cost is a big deal and I don't want to dismiss that but on the high-end products, in my opinion, there's no excuse not to have it integrated today," he said. "I use the Fitbit devices and the trackers that estimate distance and, as a runner, it's just not suitable." Oakes also stressed that true GPS accuracy – critical for professional training – could only be achieved with an isolated GNSS receiver: "Something like the Snapgradon will probably get you in the 20 metre accuracy range and for some applications that's fine." The overall message from Qualcomm, ARM and OriginGPS is that the wearable tech hardware revolution is only just kicking off and there's a clear focus on the devices yet to come. "Some of the biggest products that we're working on right now are in development and have not yet been publicly released," explained OriginGPS' Brendan Oakes. "Between wearables and drones, there's going to be a lot of announcements this year." "Wearables is a very exciting segment," agreed Qualcomm's Pankaj Kedia. "There's so much innovation. We still think we are at the first stage. We're working with phone companies, we're working with watch companies and we're working with really interesting startups. Different kinds of companies are using the technology and they will come up with form factors and use cases we haven't even thought about."